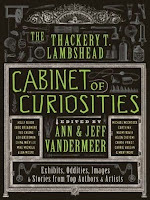 So Monkey Girl walks into the kitchen yesterday and picks up the copy of The Thackery T. Lambshead Cabinet of Curiosities I'd set down there. "What's this?" she asks that curious yet vaguely contemptuous way only preteens can manage. "Looks kinda cool." "It's a new anthology," I answer. "That's my contributor copy." "Really? You?" She flips through it a bit before setting it back on the table. Then she eyes me suspiciously. "Seriously. Why'd they send it to you?" Somehow, I doubt Evelyn Waugh ever suffered such indignity--although to be honest, he never participated in such an outright strange publishing effort, either. The Cabinet of Curiosities, edited by Ann and Jeff VanderMeer, is not so much a traditional anthology as it is a madcap idea hatched in the wee hours of the morning during a room party at a science fiction convention after consuming vast quantities of absinthe, Diet Dr Pepper and Mad Dog 20/20. It's a crackpot scheme, a joke anthology everyone talks about with the full understanding that it'll never happen. Except the VanderMeers have gone and made it happen. There are quite a few standouts in the "Brief Catalog of Other Items" that close out the book, but chief among these is Rhys Hughes' inspired "Reversed Commas (box of)" which is as wonderful as any invented punctuation could be, so much that I wish I had a box of these handy things myself. For those folks keeping score at home, the Cabinet of Curiosities is indeed a stand-alone follow-up to The Thackery T. Lambshead Pocket Guide to Eccentric & Discredited Diseases, which was nominated for all sorts of awards when it came out back in 2005 (probably because I had nothing to do with it). 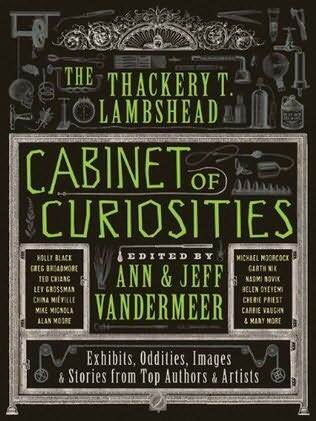 The Cabinet of Curiosities is a good deal more inventive and wide-ranging than the earlier Lambshead book (which is actually saying quite a bit). The artwork in Cabinet alone is jaw-droppingly gorgeous, with fantastic line art and seemingly vintage photography that boasts an uncomfortable authenticity at times. It's good stuff, all the way 'round. If you're a fan of the fantastic, do yourself a favor and pick up this handsome volume.